However it might as well be. 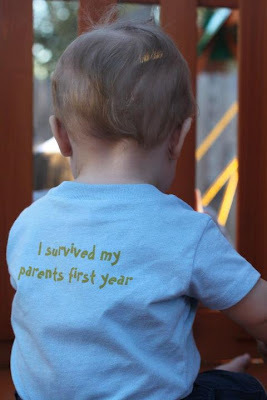 His little shirt reads " I survived my Parents First Year"
I have never done this before therefore I am brand new at this. He is new at life, I'm new at this parenting thing. I tend to think that all these other young moms around me know more about parenting then I do. They are new like me. Most seem like they have this parenting thing down and know what to do and when to do it. Me, ummm not so much. I feel like I just do it when it needs to be done. I'm not sure if I can even explaining my parenting skills. I will be the first to admit that I have no clue what I'm doing. It drives me nuts when these moms act like they are pros with the first child. Ugh it just irritates the ish outta me. I will bust out the snacks at the store/restaurant/home when C gets fussy. I will whip out the iPad with an Elmo's World faster then you can say the word WHINE. I do keep a bink in my purse for emergency's, even though we are trying to wean him off of the crack the bink. I will drop a song and dance in the middle of the grocery store to just get a giggle or smile out of that sweet little face of mine. I do all these things. I don't think they make me a bad parent. I think it makes us tick and work and everyone stay happy. I love being a parent but boy oh boy is it hard sometimes. I need to stop thinking all these other young moms know what they are doing and have all the answers. They are telling me what works for them. I am open to their advice. But they all seem to answer me so matter of factly it drives me nuts sometimes. But by no means does what they are telling me mean its going to work for C.
9 times out of 10 it probably wont. If I went around telling all these young moms what we did for C to sleep through the night is a cure all to their problems, they would probably be super pissed when it didn't work for them. We just have a great baby that loves to sleep. So young moms out there who are with me on this post. Who are going day by day, step by step, phase by phase this post is for you! That is the cutest little shirt EVER! Hey, I'm a mommy of 3 and I am still taking it day by day girl! It's all a learning game! And lets be real we all have these things that we do that others would judge us for - it's just part of life. p.s. Yo, Elmos song on my iPhone - baby crack when we are out. Sometimes I have to. Sometimes we NEED to get something done. And it's better than him screaming, crying, trying to flip himself around in a cart! lol, I have two and I still have no idea what I'm doing. Your list sounds like you are an amazing mommy that loves your child more than anything, and thats all that matters right? :) & That little shirt is the cutest thing. LOVE this post! I also think I need one of those little shirts for my little guy...too cute!